Biofinity Multifocal contact lenses represent a marked step forward in contact lens technology that has to be experienced to be believed. 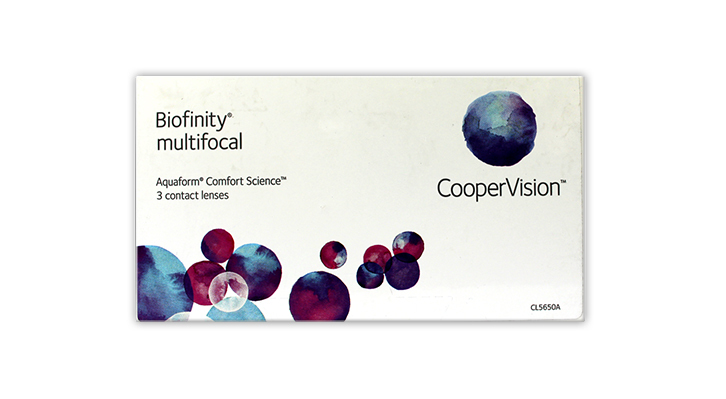 Biofinity Multifocal contacts are made from Aquaform Comfort Science Technology. It’s a unique material that is highly breathable and moist. High levels of oxygen flow freely through these silicone hydrogel lenses, helping to keep your eyes clear, white and healthy looking. CooperVision’s Balanced Progressive™ Technology helps to create a new generation of silicone hydrogel, optimised for the best clarity of vision, whether you’re looking at something near, far or in-between. Biofinity Multifocal also offers two different optical designs – so you can have contact lenses that better suit your lifestyle. The D or Dominant optical design provides greater enhancement of distance vision, whereas the N or Non-dominant optical design, gives the wearer improved sight for objects that are near. Biofinity Multifocal contact lenses provide comfort that won’t rinse off because there are no added surface treatments or wetting agents. Nothing comes between you and a comfortable, healthy, lens-wearing experience. What’s more, the naturally wettable Biofinity lens material holds water within the lens making it soft, moist and resistant to dehydration and protein deposits. Biofinity Multifocal contact lenses are approved for up to six nights and seven days of extended wear provided your optician agrees.